While you’re visiting Jackson Hole, why not savor some local, home-grown libations? Jackson Hole Winery is one such place to check out! Wine often tells the story of place—how the grapes draw characteristics from the setting in which they are grown. However, the story of Jackson Hole Winery involves a much wider cast of characters. This local story stars two places and four people. Valley residents for nearly three decades, the Schroth family makes wine at their 17-acre property along Spring Creek in South Park in Jackson Hole—a spectacular spot that inspires the memorable varietals they produce. The grapes arrive bearing the hallmark notes of their respective vineyards in the Sonoma and Napa counties of northern California, and then their tune becomes heightened when crushed and cellared at an altitude of 6,229 feet. The cool alpine air slows fermentation and aging, which cultivates distinctive personality and potent aromatics. Based in both California and Wyoming, winemaker Anthony Schroth is the one who came up with the maverick concept. 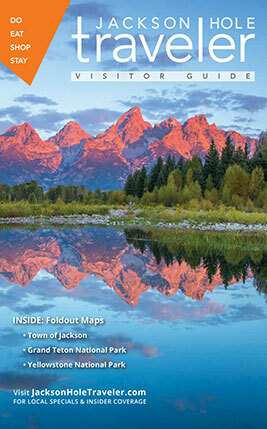 Here, he shares a bit of the history and looks to the future of Jackson Hole Winery. Q: Let’s go back to when the wine bug first bit you: What was it about that internship in college at a Napa winery that spoke to you? And how did the idea for Jackson Hole Winery take root from there? A: Getting bit by the wine bug is a real thing! This happened to me in 2005 during my first internship opportunity at O’Brien Estate Winery in Napa Valley. This was a small family-owned winery with a small production crew of three. They took a chance on me. I had no experience at all! But my studies at Sonoma State University and the fact that it happened to be harvest season was a match made in heaven. In school, we would study a chapter on what to look for in the grapes, e.g. sugar, acidity, and taste. Then, the next week I was out in the field talking with winemaker, tasting the grapes and applying this learning first-hand. This continued all through harvest and I was quickly falling in love with wine. Wine-making is physically and mentally demanding, which I think is what intrigued me most. I loved (and still love) the challenge—everything from the art of farming to the science behind fermentation to talking with people from all around the world about wine. During that first internship in Napa, I noticed a small winery facility that looked very similar to my parent’s property in Jackson. Back at school, we were assigned the task of writing a business plan for a winery, so this is where I put two-and- two together. As I started to do more and more research on the idea, it became clear that there weren’t any serious cons; every issue could be answered with, “Why not?” So, during my senior year of college, Jackson Hole Winery was born. We ended up launching the business in 2009—but it was quite the journey. The biggest challenge was convincing my parents that I knew what I was doing and encouraging them to trust me. It was such a big investment. When I proposed starting a winery in Jackson Hole, I hadn’t been making wine for very long. They, not surprisingly, thought the idea was a little crazy. But I knew that, even with the challenges of transporting thousands of pounds of grapes to Jackson while preserving their high quality, there were so many benefits to high altitude winemaking as well as market opportunities in this vacation destination. Jackson Hole Winery bottles dynamic blends, including Catch and Release Zinfandel and Rendezvous Red, a marriage of Cabernet Franc and Syrah, as well as beloved single varietals like the Russian River Valley Chardonnay. We started out very small to test out the market and grew it from there. Q: What have been some distinct challenges and opportunities of making wine in the Wyoming mountains? A: One of the biggest challenges I face is actually just getting people to try the wines and understand that we can make great wine here. People often assume the grapes are grown here and therefore are bad. Education is key. Once we explain to them how our process works, people become extremely intrigued and are dying to try it. I like to think they are pleasantly surprised! There are actually a significant amount of advantages to making wine in Jackson. First and foremost, the elevation works to our advantage. Since we are more than 6,000 feet above sea level, we are now making wines with 18% less oxygen. Anyone vising Jackson for the first time can feel the effects of less oxygen… and so can the grapes. This decrease in oxygen causes longer and cooler primary fermentations—something coveted by almost every winemaker out there. The lower temperature allows us to have longer contact on the grape skins which helps extract a rich color, distinct flavors, and structured tannins, all while preserving aromatics. This process took a little trial and error, but we used it to our advantage and it’s working! Q: Tell me a bit about how your familiarity with both the terroir of the grapes you buy and the climate of Jackson Hole becomes expressed in your wines? A: I am involved in every step of the process. I farm several of the vineyards myself in Sonoma County. I am out there every day with the vines and see first-hand the impact Mother Nature has on the vineyard—cool days, scorching hot days, rainy days. There is nothing like experiencing the variability of the growing season. Since I have been doing this for more than 10 years now, I have a relatively good idea of what to expect. There are certain elements that I love about the Sonoma growing regions and want to capture all the way through the fermentation process. For example, the Russian River Valley is best known for its Chardonnay and Pinot Noir and the key is the natural acidity in the grapes. This region has very cold, foggy mornings, so thick that you can almost cut through it. At midday, the fog burns off and temperatures rise to between 85 to 95 degrees. It’s a very unique condition where the cool foggy mornings allow the fruit to retain its natural acidity and then ripens with the hot afternoons, so I ensure that we capture those qualities by proper farming and winemaking techniques to showcase the region through my style of winemaking. You should be able to taste where it comes from, and I feel very fortunate to work with this fruit as it makes some of the most amazing wines. Q: Are there any new varietals in store? A: We will be releasing a dry Riesling from Willamette Valley, Oregon. It is a beautifully balanced, low-alcohol, aromatic white wine with juicy acidity that screams summertime. It’s like a fruit stand that meets a perfume counter and has a kid. It’s a must-try! Private tastings at the winery are available by appointment. Call 307-201-1057, or email info@jacksonholewinery.com. There is also a tasting room in downtown Jackson, just steps off Town Square, at 45 W. Broadway. Hours: 11 a.m.-7 p.m. Monday-Saturday; 11 a.m.-5 p.m. Sunday. Tastings: By appointment only. Call 307-201-1057, or email info@jacksonholewinery.com. Awards: The winery has consistently won bronze, silver and golf medals at the San Francisco Chronicle and San Diego wine competitions. Bonus: The winery has a Wolf Pack Wine Club; limited production wines are delivered to your door twice a year.